Onboard a luxury yacht, a post-wedding brunch is a perfect way to bask in the happiness of your recent wedding ceremony. Show your loved ones how much they matter to you with a post-wedding brunch they will never forget. Choosing a unique brunch venue will make the magic of the wedding last longer and give you a chance to thank your guests by treating them like royalty. Chicago’s historic skyline makes a stunning backdrop to a post-wedding brunch on a luxury yacht with Anita Dee Yacht Charters. You and your guests can enjoy the beautiful architecture of Chicago as you cruise along and enjoying fresh breeze from the water on a private yacht that has every amenity you could desire for entertaining. Contact us today at (312) 379-3191 for your initial consultation, and let the experienced wedding event consultants at Anita Dee Yacht Charters help you create a memorable post-wedding brunch. At Anita Dee Yacht Charters, we have two impressive luxury yachts to choose from for your post-wedding brunch venue: the Anita Dee I and the Anita Dee II. Both yachts are conveniently docked in downtown Chicago at the DuSable Harbor on beautiful Lake Shore Drive. If you need to dock at another location, we have many options in Illinois along the Chicago River. We know that a wedding day is incredibly busy and many guests likely have traveled significant distances, so we provide flexibility to help you accommodate all of your guests’ needs. To help you get started in planning your post-wedding brunch, we have provided more details about our luxury yachts. Please feel free to contact us at (312) 379-3191 and speak with one of our knowledgeable consultants who can answer any additional questions you have. Anita Dee I: Named after our owner’s wife, the Anita Dee I is our prized yacht that helped our business become the success it is today. At 90 feet in length, the yacht can host up to 120 passengers, making it an ideal space for an intimate occasion for you and your most valued guests. The Anita Dee I is a two-storied vessel with fine dining areas and bars on both levels for your guests’ utmost convenience. The yacht is well-equipped with everything you need for excellent entertainment, from a spacious dance floor and high-quality sound systems to plenty of space on the decks of the yacht to enjoy the fresh air and stunning skyscrapers of Chicago’s skyline. Anita Dee II: At 400 feet in length, the Anita Dee II is an impressive vessel that can host 400 guests. This luxury yacht will impress your guests not only with its magnificent size, but also with all it offers: an intimate piano lounge, a large observation deck with plenty of room to enjoy the view, a formal dining area for the finest cuisine, and a state-of-the-art helicopter pad. With three levels, this vessel can easily accommodate large groups while still feeling like an intimate gathering place for only you and your guests. A post-wedding brunch on the Anita Dee II will certainly delight and impress you and your guests. With either yacht you choose, you can rest assured that your post-wedding brunch will be one for the books. There’s no better way to embark on the new chapter of your life than with a voyage onboard a personal yacht. With over 40 years of providing successful events for hundreds of clients, the hospitality specialists at Anita Dee Yacht Charters know how to help you plan the perfect event. Our specialists are flexible and knowledgeable and can make your dreams a reality on and after your special wedding day. We offer full-service post-wedding brunch packages that include entertainment and catering, and we can also accommodate your choices for an additional fee if that is better suited to your envisioned event. Post-Wedding Brunch Catering: By the time of your post-wedding brunch, food will be welcomed—and needed. Keep your guests fueled and ready for the day’s various activities with the finest cuisine available to satisfy their appetites and treat them for all of their support. Our hospitality specialists can provide you with a list of our preferred caterers who have met the highest standards, or you can choose to use your own caterer. Whether you want homestyle, vegan, traditional, or avant-garde cuisine, our catering services can tailor the menu to meet your tastes. If you prefer to handle the catering yourself, we will accommodate the licensed caterer of your choice for an additional fee. Contact us today at (312) 379-3191 to find out more about the catering options available for your post-wedding brunch. Post-Wedding Brunch Entertainment: Our event specialists can provide you with a list of preferred entertainment services to make planning your brunch event as easy as possible. The music you choose will create the mood of your wedding event, and we have a wide range of available musical talent, so you’re sure to find just what you envision for your post-wedding brunch. Along with incredibly talented musicians, we provide the latest technology to create the ideal ambiance for your perfect post-wedding brunch. Contact our hospitality specialists today at (312) 379-3191 to find out more about the exciting entertainment options for your post-wedding brunch. 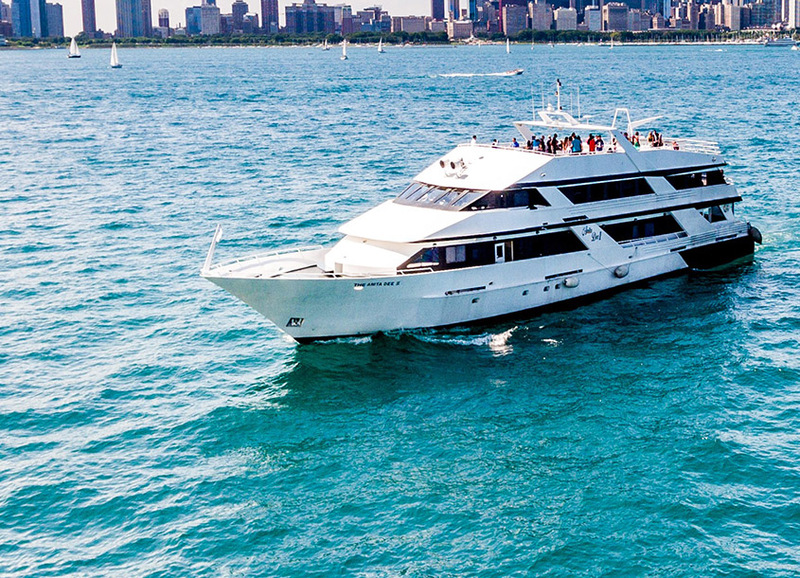 By choosing Anita Dee Yacht Charters for your post-wedding brunch event, you are offering your guests the unmatched experience and resources of Chicago’s premier yacht charter company. Your wedding day is something you want to make as special and memorable as possible, so match its importance with a post-wedding brunch that outshines any you’ve been to by hosting it on one of our premier private yachts. Wedding receptions and the accompanying events are times to celebrate a new marriage, gather those dearest to us, and create a joyous atmosphere that reflects your hopes for the future. With Anita Dee Yacht Charters, you can easily achieve these goals and have the post-wedding brunch you and your loved ones deserve. Call us today at (312) 379-3191 to get started.